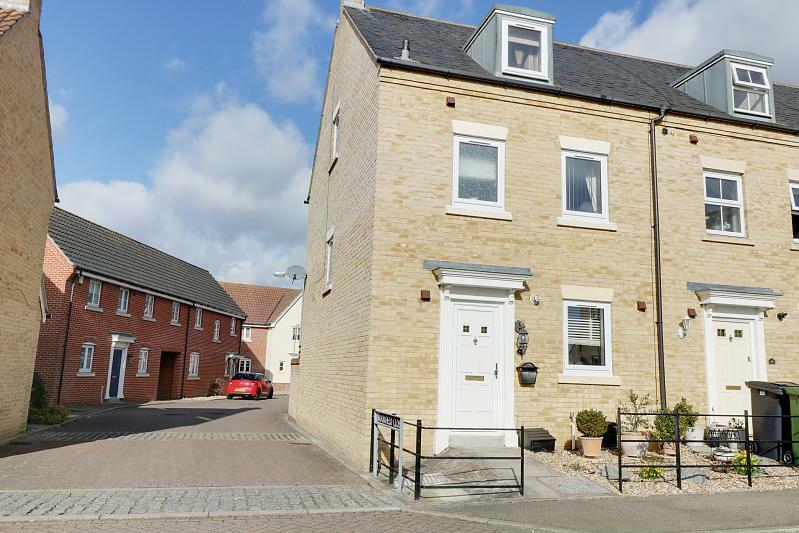 This rarely available hall entrance three storey town house will appeal to both families and couples alike, spacious and modern accommodation set in the attractive courtyard location in this highly regarded development. 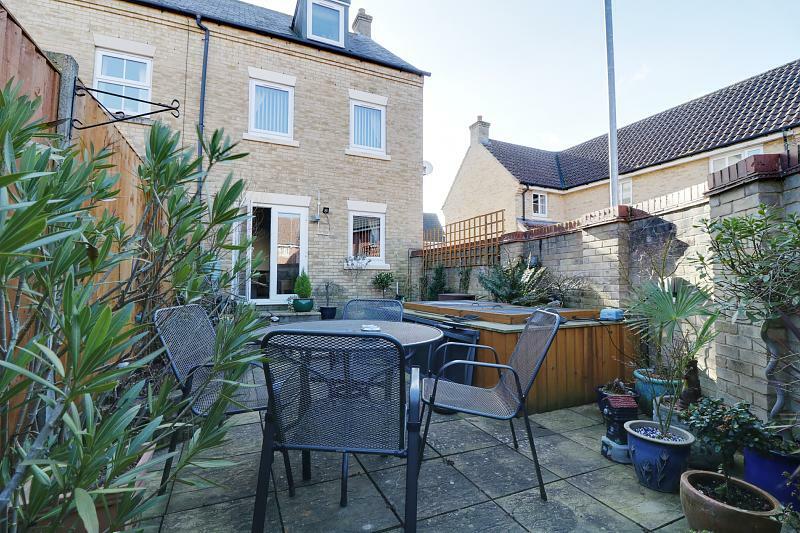 Built in 2002 and bought for its excellent plot position the property offers a popular layout with a well-proportioned kitchen to the ground floor, an attractive lounge/dining room with French doors through to the garden. 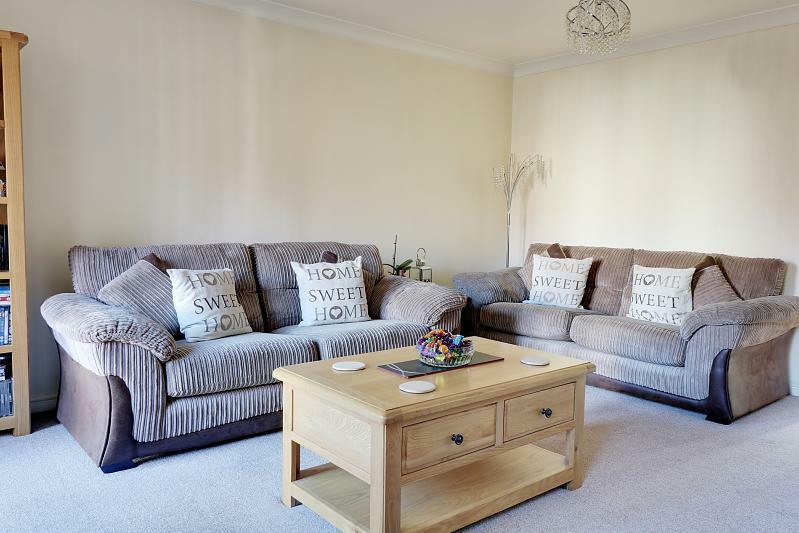 The first floor offers an extremely spacious double guest bedroom (which is currently used as a second siting room), plus a further double bedroom and a full family bathroom. 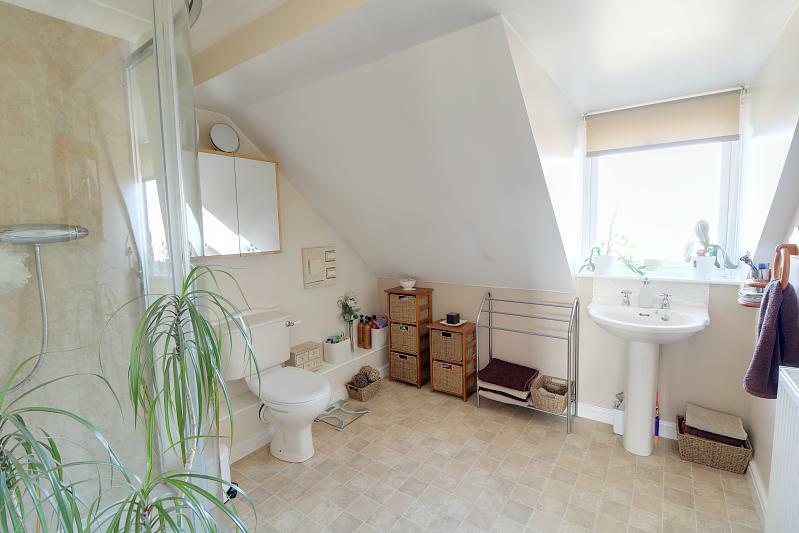 The top floor offers the unrivalled master bedroom suite with walk-I wardrobe area and spacious en-suite shower room. The property has undergone some significant improvements with cavity wall insulation, uPVC double glazing throughout and refitted gas central heating boiler. The rear garden has been attractively designed and is enclosed in the main by brick walling, which has its own pathway access leading to its en-block garage. 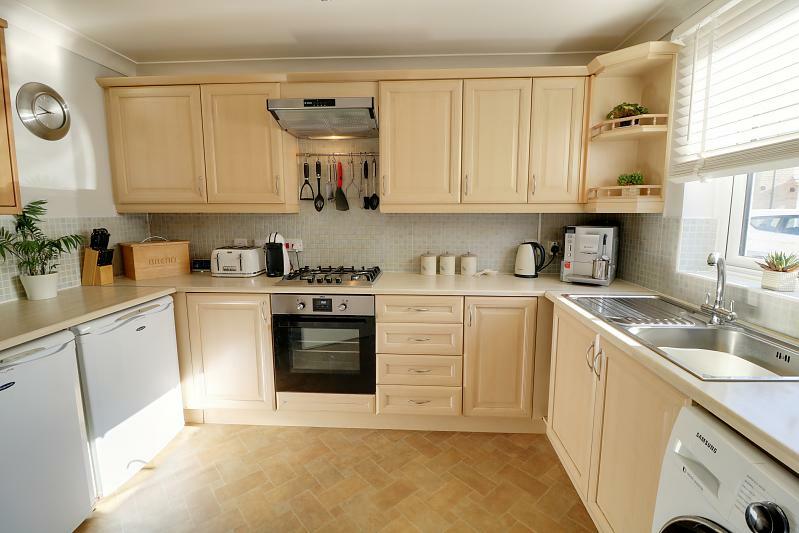 Internal viewing is highly recommended to fully appreciate the superb setting and finish of this excellent property. Two piece fitted suite in white comprising of close coupled W.C, pedestal wash hand basin with tiled splashbacks, radiator, ceramic tiled flooring, smooth finished ceiling, coving and extractor fan. Inset coir front door mat, wood effect laminate flooring, six panel colonial doors through to downstairs rooms, staircase to first floor landing, radiator, smooth finished ceiling, coving. A range of fitted base and wall units in a wood effect finish with brush chrome handles and wood block effect roll top work surfaces over, inset single drainer stainless steel sink with mixer tap and water purification tap, plumbing for washing machine, integral fan assisted Zanussi oven and four ring Bosch gas hob set within work surface, extractor fan above, space for two under counter appliances, some opaque glazed fronted cupboards, space for breakfast bar stool, radiator, smooth finished ceiling, coving, front aspect uPVC double glazed window, wall mounted gas boiler serving domestic hot water and central heating throughout the property. 15'9 (4.8m) x 14'7 (4.45m) MAX. Rear aspect uPVC double glazed window with views towards rear garden, uPVC double glazed French style doors through to rear garden, smooth finished ceiling, coving, six panel colonial door through to under stairs storage cupboard, T.V point. 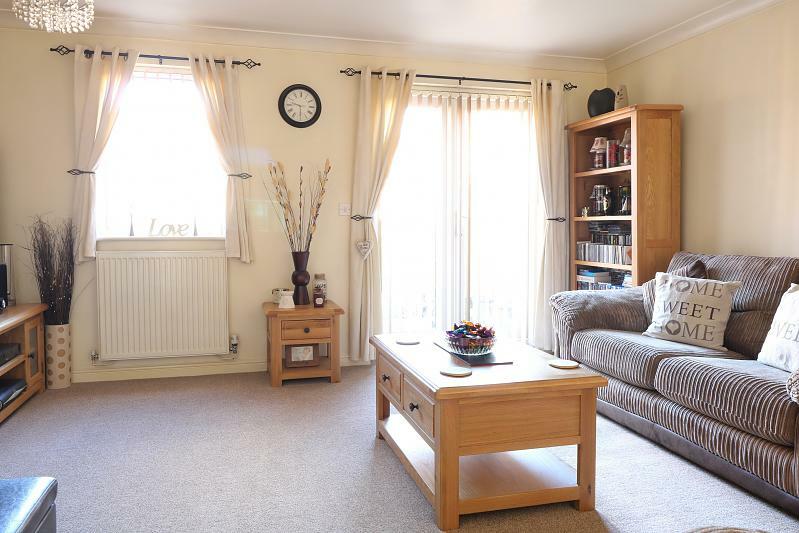 This room can be used as both lounge/dining room or just sitting room purposes should that be desired. Side aspect uPVC double glazed window filling the area with light, six panel colonial doors through to all rooms, six panel colonial doors through to airing cupboard with pre-lagged hot water tank and slatted shelving, smooth finished ceiling and coving. 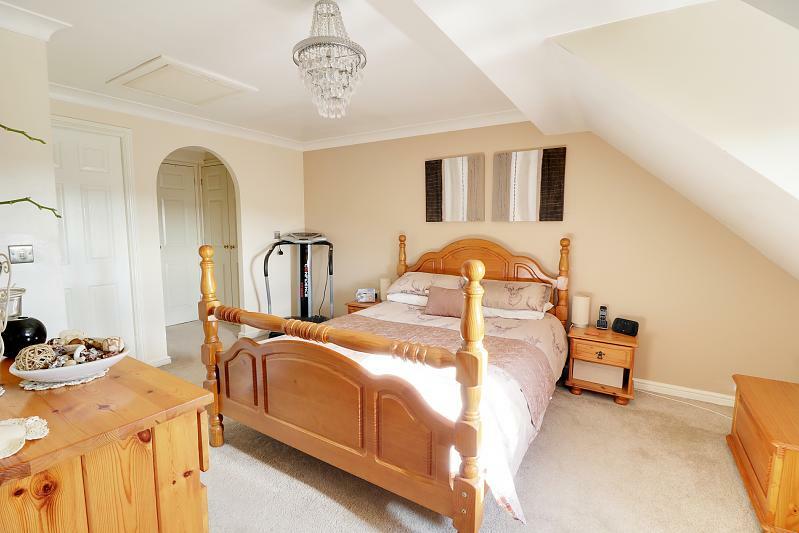 Two double built-in fitted wardrobes with a mixture of hanging rail and shelf space within, twin rear aspect uPVC double glazed windows, radiator, smooth finished ceiling and coving. 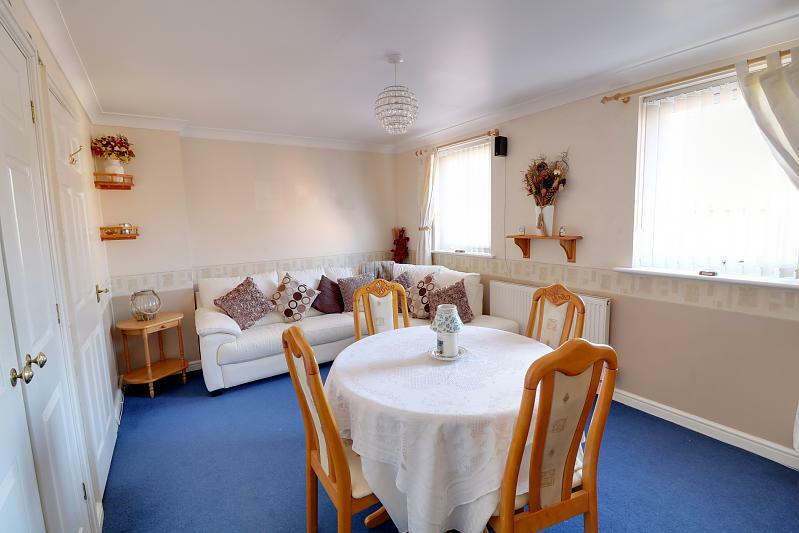 This room is currently used as both second sitting room and formal dining room, and really does prove the flexibility of this unique layout. 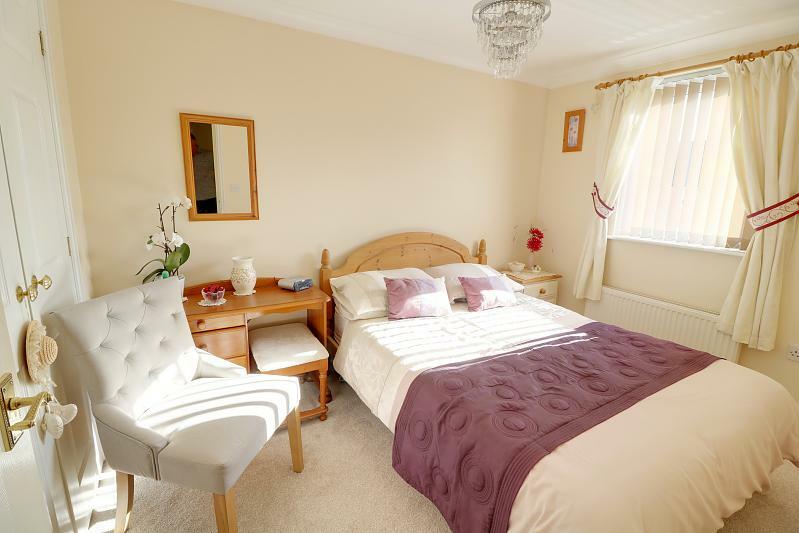 An excellent double guest room with front aspect uPVC double glazed window, double built-in fitted wardrobes with hanging rail and shelf space, telephone point, smooth finished ceiling and coving. 6'8 (2.03m) x 6'2 (1.88m) MAX. 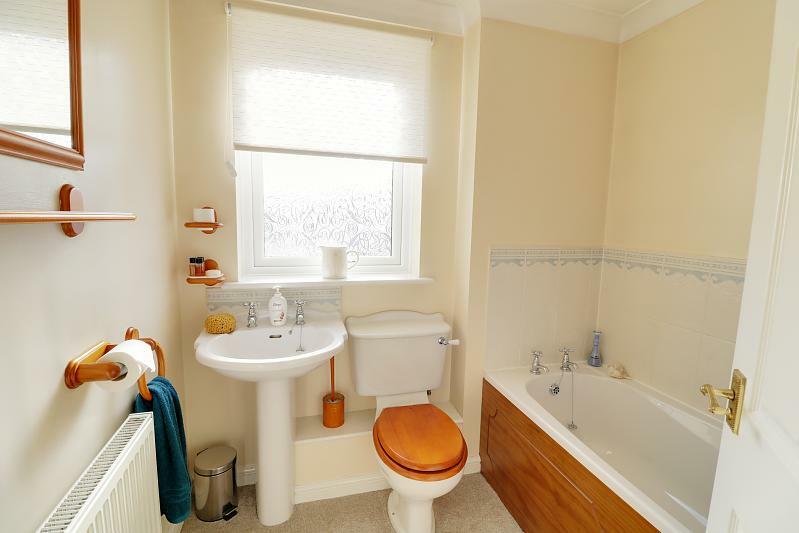 Three piece fitted suite in white comprising of bath with chrome coloured taps and tiled splashbacks, close coupled W.C, pedestal wash hand basin, radiator, obscured front aspect uPVC double glazed window, smooth finished ceiling, coving, extractor fan. Side aspect uPVC double glazed window, six panel colonial door through to the master bedroom suite. Front aspect dormer style uPVC double window, smooth finished ceiling, coving, radiator, various niches for use of study area or for use for further wardrobes or storage (should that be desired), access loft space, six panel colonial door through to en-suite shower room, archway through to dressing room. Two sets of double doors lead through to deep hanging rail and shelf storage. Three piece fitted suite comprising of corner shower cubicle with semi-circular glass and chrome sliding cubicle door to and oversized cubicle with marble effect insert panels and chrome coloured mains pressure shower set within, close coupled W.C and pedestal wash hand basin, obscured uPVC double glazed window, smooth finished ceiling, coving, extractor fan and radiator. The property is enclosed by wrought iron railings giving access to pathway to front door. An area laid to stone for standing of pots plants etc. An area to the front where there is ample parking. 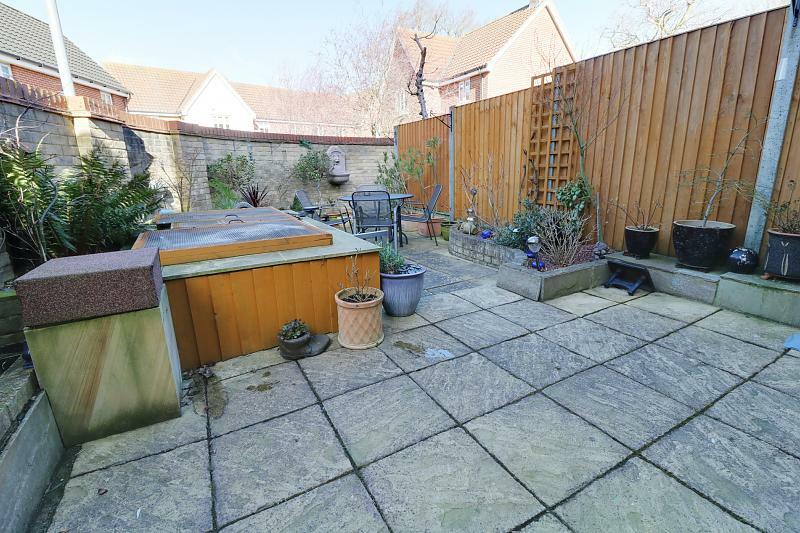 The rear garden has been designed for ease of maintenance being mainly laid to patio with raised beds around the edge with a large range of plants, trees and shrubs, feature pond, ample outside dining and entertaining space, power supply to the rear of the garden. The garden has an attractive curving brick wall and to the rear has pathway access through to where the en-block garage is. Outside tap. En-block with up and over door, power and light. Space for parking.